Two lucky girls are cast as the heroines in a remake of the "Dream of the Red Chamber" TV series according to an announcement made on Saturday. 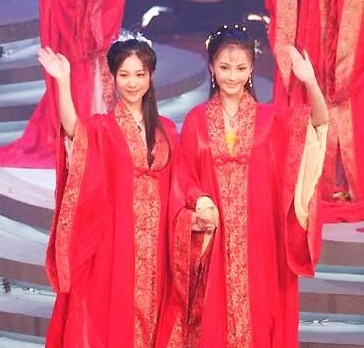 The two girls, Li Xudan and Yao Di, outshone a pool of applicants in the acting contest. But some netizens still think no one can replace Chen Xiaoxu, who made a classic on the screen through starring Lin Daiyu in 1987 version of "Dream of the Red Chamber". Li Xudan will play the role of Lin Daiyu, or Sister Lin, an intelligent and gifted girl who died of grief, as her love for Jia Baoyu was opposed by his feudal family. Yao Di will take on the role of Xue Baochai, who observed the feudal moral code and was forced to marry Jia Baoyu. The tragic love triangle of Jia Baoyu, Lin Daiyu and Xue Baochai is the centerpiece of the play. The two actresses won the contest launched last summer by Beijing Television Station to find actors for the three leading roles in the remake of the TV series. Pretty girls from across China competed for this rare opportunity. Eighteen-year-old Li Xudan has been an actress for the Yue Opera, a traditional Chinese opera famous for its morbidezza. Yao Di graduated from the Beijing Film Academy, and has acted in many TV plays. The casting of Jia Baoyu, another leading role of the play, remains undecided, according to the director-in-chief Hu Mei.